The Nordco way; to safely increase a product’s velocity through its value chain for markets that utilize rail transportation by providing highly engineered and specialized products and services with full life-cycle support. Nordco’s Shuttlewagon Business Unit stands committed to safely advance product velocity. Just one way Shuttlewagon achieves this is by making available quality rental machines to companies who rely on mobile railcar movers, locomotives or other means for the purpose of processing railcars through loading, unloading or industrial switching operations. Shuttlewagon, Inc. continues to expand its fleet in response to market demand for quality mobile railcar movers. Doing so has enabled Shuttlewagon to make dramatic improvements to the benefit of rail operators; increasing the number of dispatch points across North America, expanding a robust fleet of Shuttlewagon Mobile Railcar Movers to include Trackmobile™ and Rail King® mobile railcar movers, unlimited tractive effort capabilities up to 85,000lbs draw bar pull, and customer specific rental programs. Direct, non-weight transfer AAR coupling is often the most safe, most practical means for moving railcars within an industrial switching application. In recognition there are a number of users who operate with alternative weight-transfer coupling systems, Shuttlewagon, Inc. also offers Trackmobile Mobile Railcar Movers and Rail King Mobile Railcar Movers. Companies rent machines for a number of reasons. These rental needs come with many different requirements. Shuttlewagon takes a “nothing-is-off-the-table” approach to working with a customer to construct an arrangement that meets all the expectations for its site. While any one particular machine currently on rent may not mirror the same arrangement of any other rental machine in the fleet, it only suggests Shuttlewagon’s willingness to meet customer needs in a manner that delivers value to the specific operation. 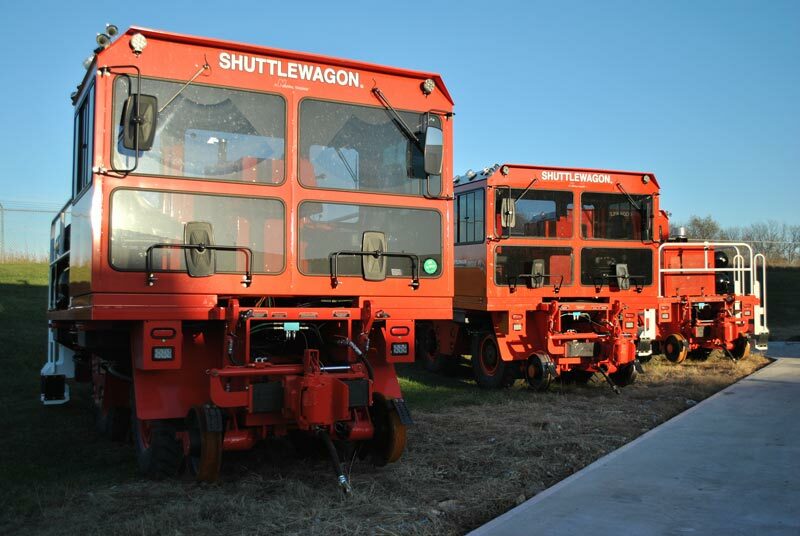 Shuttlewagon’s fleet consists of all makes and models, the majority which are lower-hour, late-model machines. Rental arrangements include but may not be limited to emergency rental, back-up rental, short-term, long-term, short-term rent-to-own, long term rent-to-own, seasonal rentals and time triggered rental swapping programs that always keep a new machine in operation through the course of its standard Shuttlewagon factory warranty period. Contact Shuttlewagon today to get set up for a site specific rental program. Learn more about how a Shuttlewagon could improve your operations.